When it comes to investment-grade silver bullion coins, “monster boxes” are the most popular choice. These are boxes of coins, as they are shipped from the mint. The two most common Monster Boxes are the one ounce American Silver Eagle and the one ounce Canadian Maple Leaf. Every one-ounce American Silver Eagle or Canadian Maple Leaf bullion coin shipped from the mint is contained within a monster box. Within the precious metal and coin collecting markets, monster boxes are frequently bought or sold intact because of their convenient size. Each monster box contains 500 coins, which are each 1 troy ounce of silver. A complete box of American Silver Eagle one ounce coins contains 25 plastic tubes, each containing 20 coins. Because of the weight of the coins contained inside, most monster boxes are actually made of plastic. The Canadian Silver Maple Leaf box is typically yellow or a jewel tone such as red or blue. 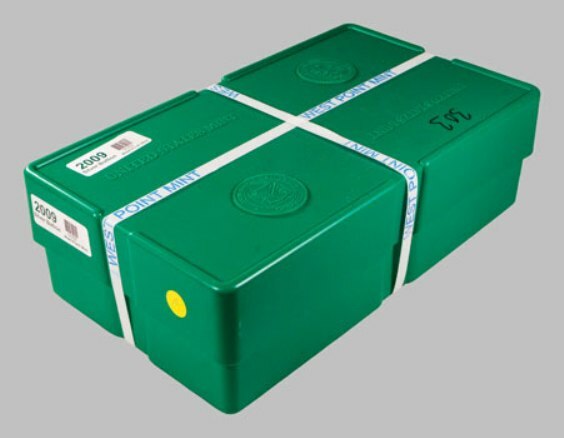 The one containing American Silver Eagles is green, giving it the nickname “green monster box.” The top of the plastic box is imprinted with the Treasury seal and identification of the type and date of coin contained inside. Monster boxes can be a great option for those looking to purchase silver in bulk for investment purchases. This is the most cost effective way to invest in silver bullion coins. By buying in quantity, it is often possible to receive lower premiums over the spot price of silver than when buying individual coins. On the other hand, they are usually not preferred by collectors looking to add a fine example of the coin to their collection; due to the quantity and sheer silver weight of the coins involved, monster boxes cost thousands of dollars. Monster boxes are sealed by the mint prior to shipment. For example, the American Silver Eagle monster box has two straps across the box bearing the name of the U.S. Mint. These straps must be cut in order to open the box. Since they are sealed by the mint, investors can be assured of their authenticity. In terms of coin quality, the coins found in a sealed monster box are top of the line, as anyone who breaks the seal of the box is the first to handle the coins since they left the mint. In many cases, the monster box will be split up into tubes or individual coins before being resold. Some coin collectors have opened monster boxes in the hopes of finding a high-grade Silver Eagle. However, investors tend to keep their boxes sealed, as a guarantee of the quality of coins contained inside. Despite their name, “monster boxes” are actually surprisingly small. For example, the American Silver Eagle monster box measures 8.5” by 14.5” by 5”. Meanwhile, the Gold Canadian Maple Leaf monster box measures 10” by 6” by 3 1/2”. However, they are quite heavy, with the American Silver Eagle box weighing in at approximately 35 pounds. Many investors find monster boxes to be a compact way to store their precious metal investment.